Distinguishing between the quality of the music and the performance requires taking a somewhat analytic approach. The Fontenay performance if the lovely scherzo from the 3rd trio illustrates the issue. This is an immediately attractive four minutes of music that grows better and deeper the more you get to know it. But the Fontenay performance is marred by some heavy-handed and insensitive pianism from Wolf Harden. It's partly covered up by quality string playing from Michael Mücke & Niklas Schmidt but focusing on just the pianism, and ignoring the impact of the music, what you hear is some dishrag dull keyboard work. Thus doesn't mean I don't enjoy this scherzo. It means that it can be performed better. And it has been. Wolf Harden also tends to bang: witness the opening if the 3rd Trio’s finale or the more aggressive portions of the music throughout. But the good aspects of the Fontenay are heard well in the disc’s very opening, with a well-calibrated build up in the beginning of the 1st Trio’s allegro. The recorded sonics are very good. I recommend as superior alternatives the Brahms set from the American Golub-Kaplan-Carr Trio, the classic Suk-Katchen-Starker recordings or the Dumay-Pires disc of Trios 1 & 2 on DG. My under-the-radar favorite is a truly great 1st Trio done by the Boston Chamber Music Society. In sum, this Fontenay set is a good release but isn't among the top contenders - 4 stars. 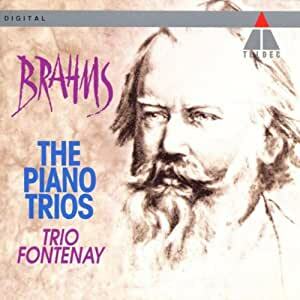 Piano Trios is a 1992 Teldec Classics International recording starring Trio Fontenay as they play Piano Trio's by Johannes Brahms. Ingeborg Allihn has written the music notes. A very pleasant and delightful recording that I very much enjoyed listening to. Highly recommended. 5/5.